It should be up and running in China early next year. Roofs and windows of buildings aren’t the only surfaces that can be used to generate solar power. In China, construction has begun of the country’s first solar highway, in which solar panels are placed underneath transparent concrete. As reported by Electrek, the solar highway is a 2 km (1.2 mile) stretch of road located on the Jinan City Expressway, and it’s divided into three layers. The see-through concrete shields an array of solar panels of two sizes. Beneath the solar panels is a layer that will keep them isolated from the damp ground. 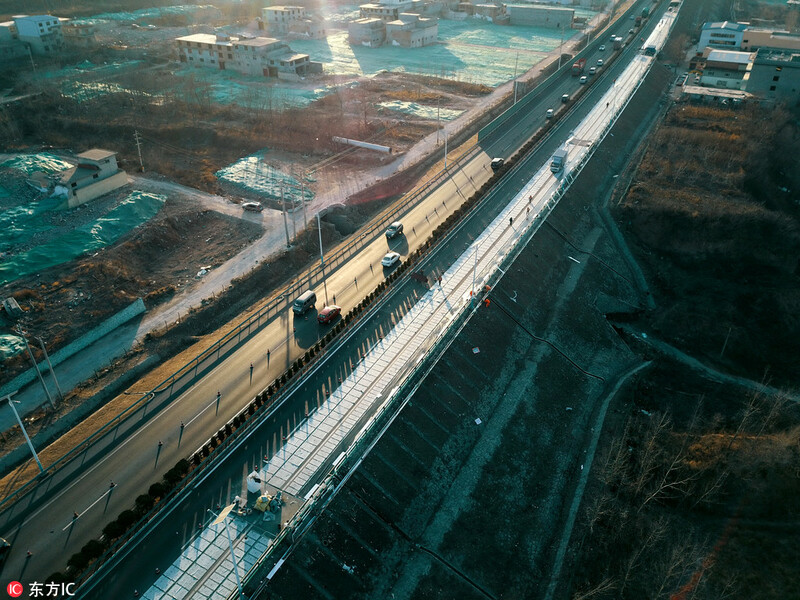 The road itself has already been completed, and now it’s only a matter of connecting the grid, which is expected to be finished by the end of the year alongside the completion of the Jinan Expressway’s south section. This isn’t the first solar road China has worked on. Earlier this year, the Qilu Transportation Development Group — which is also handling the Jinan Expressway solar road — built a 160 meter (0.09 mile) long solar road in the city of Jinan itself. It’s capable of heating up to keep the highway clear of snow and ice, and may one day be able to wirelessly charge electric vehicles. The new solar highway is expected to one day be equipped with the same features. Outside of China, solar roads are nothing new. In 2014, the Netherlands built a bike path fitted with solar panels to generate electricity; a village in the north of France opened a km (0.62 mile) long solar road in 2016. In the U.S. the Missouri Department of Transportation agreed to begin testing solar sidewalks near Route 66. Solar roadways may have their critics (they are susceptible to being covered by dirt and other debris), but as their efficiency and applications improve, they’re sure to prove their value. And with EVs becoming more popular, the world’s going to need more ways to keep their vehicles charged and ready to go.